This Is new with open box. This item is Unused in Original Box. Acessories are still sealed. You will have to open the cancellation request yourself. This warranty only covers Catastrophic hardware failure. In order to claim your warranty all warranty labels must be intact. Trending at $15.82eBay determines this price through a machine learned model of the product's sale prices within the last 90 days. Used We tell Westell Model 327W. Includes cables, power adapter, and used manual. Like new condition. Model number D90-327W30-06 Wind River. Good pre-owned condition. Tested and can see its setup screen (see pics). I will always to my best to resolve any issues you have. This is a used unit, but it works fine. Cleaning out pole barn and found this unit with instructions. In new condition with heavy box wear. Check and in working condition. Please see photos. Router and power cord. Please do not message asking for a lower price. Make sure your address is correct BEFORE purchasing otherwise we will have to cancel the order, if it is shipped to the wrong address and it comes back, you will have to pay for shipping the second time or we will have to refund minus shipping we paid. Most items come from storage units so we don’t know the previous owners. 6 DSL Line Filters. 1 AC Power Adapter. We are eager to assist you in making the correct choice. We moved and no long use Verizon/Frontier for internet. Includes power plug. westell A90-750044-07 ADSL2 wireless modem router. Condition is Used. Shipped with USPS Priority Mail. Model: 2200. Model: A90-210030-04. Downstream Data Rate: 8MB. S/N: 02B408112399. They have been cleaned and power tested. IP 192.168.1.1. DSL modem (step 2). --Kit contains DSL filters (step 1). Installation can be done in minutes through a standard browser interface. They are separated from each other and now held together with a rubber band as show in pictures. Wireless 4 wired Ethernet ports. Lightly used but working DSL modem with the power supply. I also include DSL phone filters for your land line phones (if you have them). Bid with confidence, ask questions, and the sale is final. I will ship within 48 hours of PayPal payment. It was pulled when the service was changed. 2 In-line Filters. WESTELL VERSALINK 327W MODEM / WIRELESS WI-FI ROUTER Model B90-327W15-06 WORKS Excellent Pre-Owned Condition. Light scratches from normal use as shown. See Photos. Thanks For Looking! CLEAN unit with ALL factory accessories. If you need a filter that installs in the Verizon junction box, I can accommodate that, I have 1 to spare. 3 PORTS: DSL, USB, ETHERNET. WESTELL Model 2200--DSL MODEM ROUTER (A90-220015-04) --with Power Supply. Condition is Used. Shipped with USPS Priority Mail. VERIZON WESTELL Model A90-750015-07 ADSL2 Modem Router REV W. Condition is Used. Shipped with USPS Priority Mail. Guide book, Install Disc ,Cable. you can google online or youtube. sold as it, no retu. THE PICTURES ARE FROM THE ACTUAL ITEM YOU WILL RECEIVE. westell D90-327w15-06 Verizon Wireless DSL router. Was in working condition then. It does power on. No local pickup. NO EXCEPTIONS. 2 DSL 2 WIRE Filters. 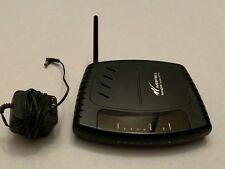 Westell DSL Router Modem Model C90-610030-06 Wind River Internet & AC Adapter in working used condition. Shipped with USPS First Class Package. Includes all cables. Please ask questions before bidding to ensure a smooth transaction. Thanks for looking! Trending at $15.36eBay determines this price through a machine learned model of the product's sale prices within the last 90 days.